These blueberry buds aren’t as swollen as they should be by this time of year. Northwest cherry crops are also behind. Grain silos outside of Connell, Wash. reflect in the mud puddles left by heavy spring rains. Gary Middleton is worried about his cherry and blueberry buds outside of Eltopia, Washington. They’re developing late. And it’s gnawing at him. A week or so might not seem like a big deal to a non-farmer, but that short window can mean the difference between higher prices for Middleton’s crop, or a potential loss on his harvest. Several major crops in Oregon and Washington are significantly delayed from foul winter weather and a cool spring. Wheat farmers are having trouble planting in the wet ground. Potatoes are still being planted a month late. And fruit tree buds are developing slowly. Some of Middleton’s cherry trees even sit in large puddles of water, and just getting work done on the farm has been a challenge with heavy February snow, and many rainy and windy days delaying fertilizer and pesticide applications. 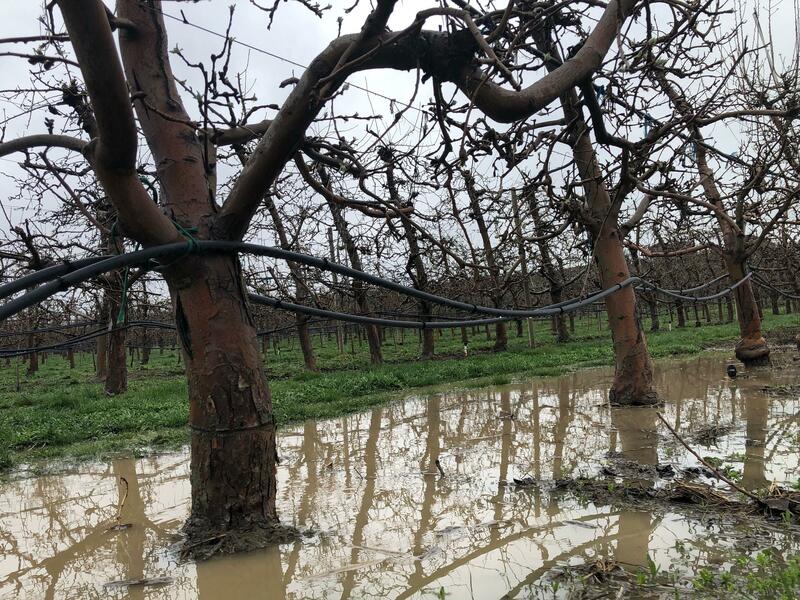 Budding cherry trees stand in puddles of water from heavy spring rains on Gary Middleton’s farm outside of Eltopia, Wash.
“And we try to get on as much spray on as we can before the wind becomes an issue and that’s what we do every day,” Middleton says. Middleton says his crews are working around the tough conditions to try and catch up. Heat will be on them soon. He says if his harvest is even just a week late, he could miss the premium prices. He’s trying to hit the profitable and big fruit-eating holiday: Independence Day. He’s hoping spring heats up gradually, “with no wind,” he says laughing. It’s a similar story in Northwest wheat country, where farmers are running as much as five weeks late planting their spring wheat crops. Wet ground means tractors haven’t been able to work on steep hillsides in Washington’s Palouse region. Winter wheat too -- planted in the fall -- is late in waking up and growing. That means those crops might reach critical points of their development right when the scorching heat hits. That could end in a light crop, lower grain quality or shriveled kernels. Spilt seed makes patterns on the metal truck scale. Many wheat-country farmers have been changing their seed orders after unusual weather patterns in the Northwest pushed back planting. 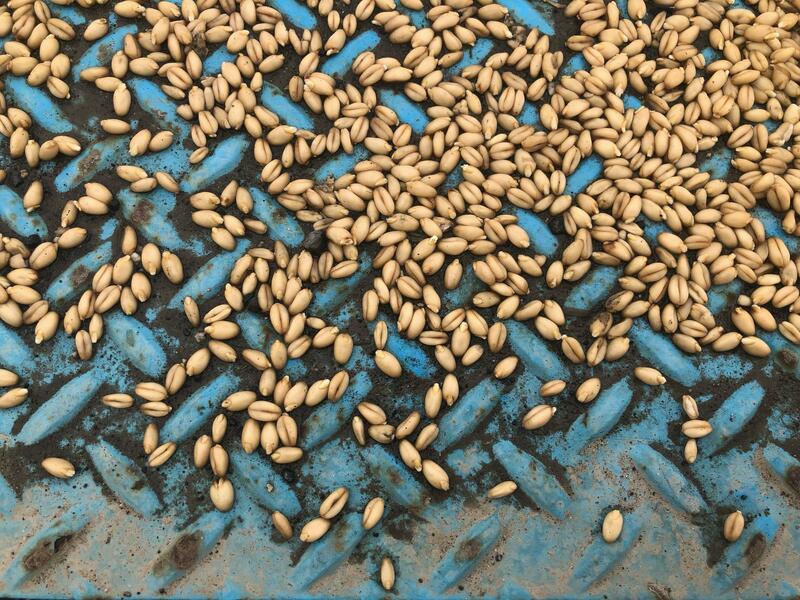 In Connell, Wash., Dana Herron sells a lot of seed. Huge silver silos sit just outside his office. His muddy boots shift back and forth under his standing desk. Herron says farmers have been coming to him and switching their seed orders to match these unusual conditions. He says this spring, many farmers are spending more time in his office than usual -- trying to make those tough decisions. People with Celiac disease are a bit closer to enjoying gluten products again. With the help of genetic modification, a team of Northwest scientists have engineered a unique wheat variety that’s safe for people with gluten sensitivities and allergies.